For too long the artist has been estranged from his own “time”. Critics, by focusing on the “art object”, deprive the artist of any existence in the world of both mind and matter. The mental process of the artist which takes place in time is disowned, so that a commodity value can be maintained by a system independent of the artist. Art, in this sense is considered “timeless” or a product of “no time at all”; this becomes a convenient way to exploit the artist out of his rightful claim to his temporal processes. The arguments for the contention that time is unreal is a fiction of language, and not of the material of time or art. Criticism, dependent on rational illusions, appeals to a society that values only commodity type art seperated from the artist’s mind. By separating art from the “primary process”, the artist is cheated in more ways than one. Separate “things”, “forms”, “objects”, “shapes”, etc., with beginnings and endings are mere convenient fictions: there is only an uncertain disintegrating order that transcends the limits of rational separations. The fictions erected in the eroding time stream are apt to be swamped at any moment. The brain itself resembles an eroded rock from which ideas and ideals leak. The Spiral Jetty, created by artist Robert Smithson in the year 1970, lies some 15 miles from the Golden Stake National Monument, in the fantastical state of Utah. It lies in an area named Rozel Point towards the north coast of the Great Salt Lake. It is an example of how a monumental form catches your eye, then your fancy, and draws you into itself. The fact that it is a spiral, upon which you can walk, is a guarantee of the deliverance of this effect. Entrancing and mysterious, this sign unravels as you enter it and continue along its path, and the encounter with the mysterious churning of the water, as well as its arcane mixture of chemical and biological agents, creates an unsurmountable aesthetic experience; comprised of textures, hues, and a variety of consistencies of mineral forms. Visiting it is a riveting experience, coupling the effect the Sun, the geology of the area, the Great Salt Lake, and the artistic ingenious of Smithson -- creating one of the most primordial of experiences, as well as taking you on a journey of introspection and exploration in extremophile conditions. Artist Robert Smithson is best known for his signature "Earthworks" -- large-scale works of art that he made in Italy, Holland, and throughout North America from 1969 until his death in 1973. 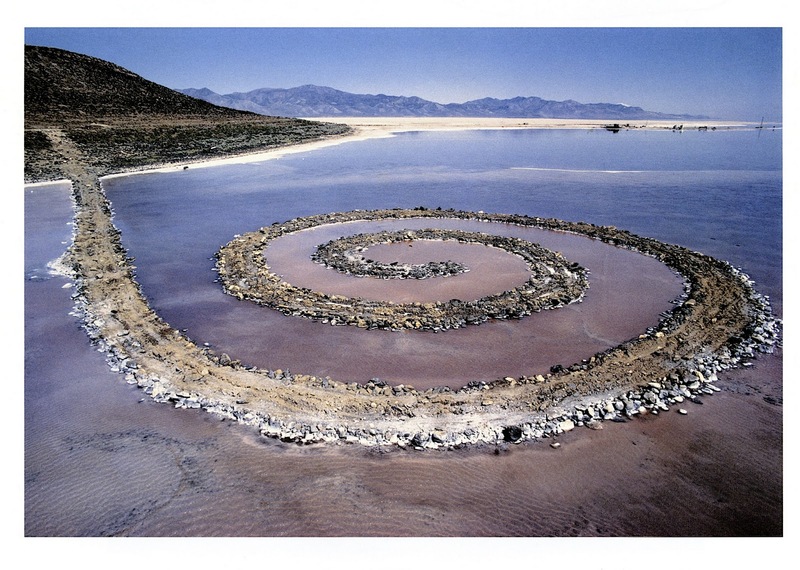 His "Spiral Jetty", an icon of 20th century art history, was built out from the shore of Utah's Great Salt Lake in 1970. Smithson was born and raised in New Jersey. Throughout his career, he would leave New York to explore his native land -- and make art out it. He called these pieces "Non-sites". The Montclair Art Museum's groundbreaking exhibit "Robert Smithson's New Jersey" brought these seminal works together for the first time.